Ichiro Ozawa is one of the most important figures in Japanese politics. He was very close to becoming Prime Minister in 2008. He has 6-dan diploma of the Nihon-Kiin and two famous teachers in Japan: Yoda Norimoto and Umezawa. 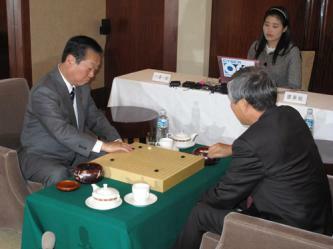 Few days ago he played with Cho Hunhyun, 9p during Ozawa's visit to Seoul. I will not tell you, was it fake victory or not. Will just show 2 moves, which were not the best moves: 149 and 197. After the game Cho Hunhyun gave Ozawa Korean 6d diploma. Forgot to say - the game was broadcasted on Cyberoro, so I posted it here. Alex, did you consider that maybe there is an order of moves mistake in the .sgf? For example, perhaps the B8 empty triangle was actually a jump to B9, but there is merely a mistake in the game-record. The resulting shape would be exactly the same. Because, for me, it's unfathomable that a pro would make a yose mistake of this level. O17 is normal. Merry Christmas! Maybe the most important thing when you are taking handi stones is to make sure all your stones are working together. O17 is too low and thus works against the other hoshi stones. If black wanted to respond he would play 016. But its not that reasonable to respond because white needs to live somewhere. So the more pressure you put on white the more you are helping him out. @Guerecon: Could you explain why O17 is unreasonnable ?? Ah I think even kyu players know that O17 is unreasonable. Should really just tenuki and then eventually play P15. Unless black knows where white is going to live then he cant efficiently.